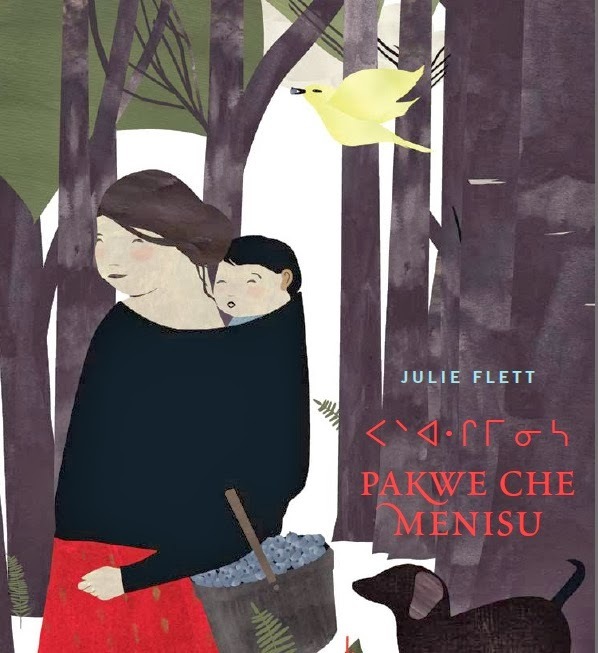 In 2011, I read Julie Flett's alphabet book, Lii Yiiboo Nayaapiwak lii Swer. In English, the title of that book is Owls See Clearly at Night. I wrote about it in January of 2012, noting especially Flett's gorgeous art. Not long after that, I read Richard Van Camp's Little One. Flett did the art for it, and like Lii Yiiboo Nayaapiwak lii Swer, the art is gorgeous. Lovely, isn't it? 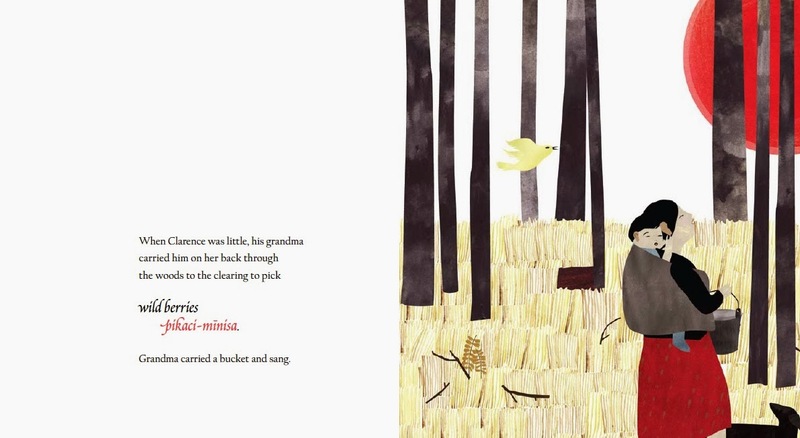 When you turn that page, you'll see Clarence walking behind his grandmother, no longer a baby. He is now five years old and sings along with his grandma as they gather berries. Flett's art is both--bold and spare--and so are her words. Together or apart, they exquisitely convey the relationship of Clarence and his grandmother and the simple act of being outside gathering berries. That alone would make this a stand-out book, but there's other things to note that make it exceptional. The Cree language sprinkled throughout is one. Another is the recipe for wild blueberry jam. And yet another is that Flett is Cree Metis herself. I'm really taken with this book! Wild Berries is a 2013 book, published by Simply Read Books. If you order from Amazon, please consider using this link to place your order, because a portion of your purchase will go towards the American Indian Library Association, including its Youth Literature Award: AILAzon.com. Thanks for calling this lovely book to everyone's attention. 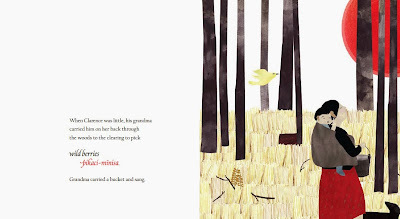 It's a stunningly beautiful book -- both text and illustrations. I was thrilled to get to review it for Horn Book recently.